Valentine’s Day has once again crept up and a movie that highlights all the highs and lows of the day is the appropriately named film, Valentine’s Day. 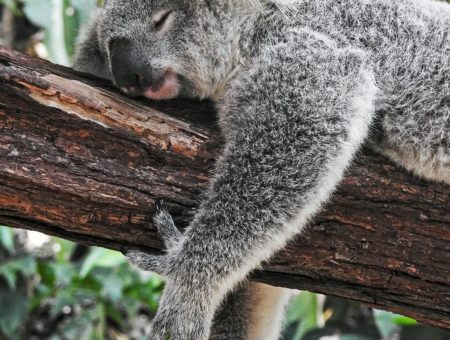 The film shows the lives of various, interconnected characters and the pressures and emotions they all go through during the fourteenth of February. This first ensemble is inspired by Felicia, a high school student who is experiencing young love with her boyfriend Willy. Her style is cute and casual, but still very comfortable. Felicia’s looks are perfect for class or casual weekends! To recreate Felicia’s look, start with a plaid shirt or tunic. 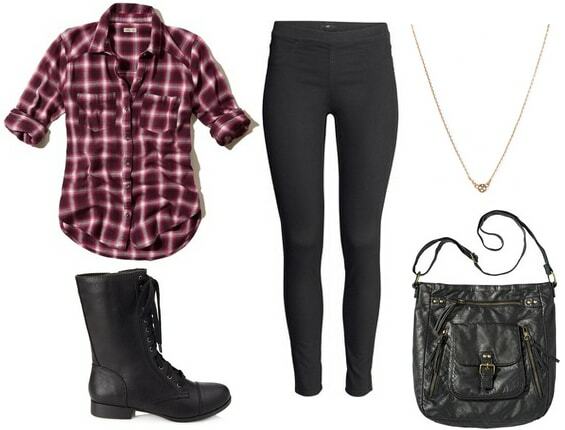 Add a pair of black leggings or skinny jeans tucked into a pair of black boots. Next, wear a roomy crossbody bag to help keep the focus on the top. Accessorize with your favorite jewelry, like this delicate pendant necklace. This next outfit is more professional than the other looks featured in this post, which makes Kara’s outfit a chic choice for occasions where business attire is required. The purple in her outfit is a nice twist on the typical neutral-colored business look, and a few tweaks can make it work outside the office, too. Start by pairing a purple blouse with a black pencil skirt. If you want to create a less professional outfit, you can wear any pencil skirt in your desired length or swap it for a black skater skirt. Complement the top with a pair of purple earrings, then add visual interest with a layered necklace. Finish the look with a pair of cognac-colored heels. If you are looking for an outfit that is playful with a dash of sophistication, this next outfit is for you! Julia wore this ensemble while teaching, but this look can be worn outside a professional setting. The color combo and polka dots create a retro-inspired ensemble that is prefect for a casual date or a day out with friends. 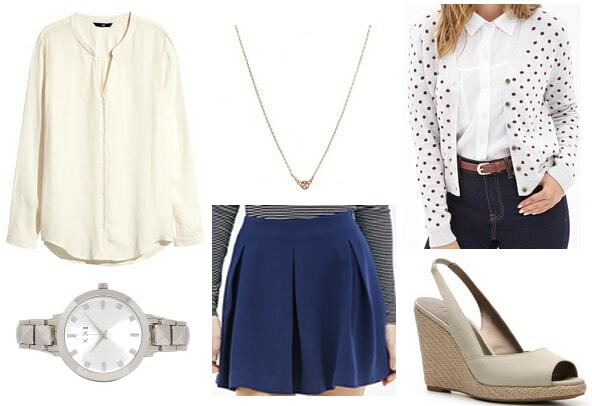 For a similar look, tuck a white blouse or shirt into a blue skater skirt, then add a red-and-white polka dot cardigan. If polka-dots aren’t really your style, go for a solid white or red cardigan instead. Keep the accessories simple with a pendant necklace and wristwatch. Finish the look with neutral-colored wedges for a boost of height. Julia’s movie fashion was so great that I wanted to create another look inspired by her style. This second outfit was what Julie wore to her friend’s annual “I Hate Valentine’s Day” party. You can rock similar look on a date or on a fun night out with friends. Create a wow-worthy night out look with a black sequined dress. If finding a similar a dress is difficult, try pairing together a black sequin top with a solid black skirt. Add a pair of black pumps, then accessorize with small hoop earrings and a matching necklace. Finish the ensemble with a classic red manicure. Have you seen the movie Valentine’s Day? What are your thoughts on the film and the outfits above? What films would you like to see in future Movie Inspiration posts? Please leave your thoughts in a comment below! Next How to Dress Like Lupita Nyong’o… for Less!